It is always a pleasure to see politicians laying aside their differences and uniting in celebration of good things. Labour leader, Ed Miliband and Conservative International Development Secretary, Justine Greening have done just that by recording the above video to lend their support to this year’s Christian Aid Week, which is the largest single act of Christian witness in the UK. In the video the two MPs have praised the efforts of Christian Aid supporters and thank those who spend the week raising money for the organisation’s work with the world’s poorest people. Mr Miliband said: ‘I know there will be about a hundred thousand volunteers for Christian Aid going out and raising money in this week and I want to say to them, thank you, because it is an incredible thing that you are doing. Mrs Greening said poverty alleviation was vitally important for people both abroad and at home. ‘Together we really can make a big difference and I think that’s why the work that Christian Aid does is so important,’ she said. The theme of this year’s Christian Aid Week is Tackling Violence Building Peace and focuses on the millions of people whose lives have been torn apart by conflict. Mrs Greening said: ‘We’ve worked hand in hand on the ground with Christian Aid in neighbouring countries with Syria that have refugees. That work is critical and it’s work that will make a difference in the long term’. In keeping with this year’s theme, Christian Aid’s Head of Middle East Region, Janet Symes has written exclusively for God and Politics on her experience of visiting a Syrian refugee camp in northern Iraq and the difference the money given to Christian Aid can make for thousands finding themselves in such desperate situations. It can be read here. 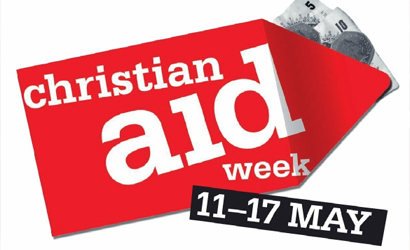 To donate to Christian Aid Week, give online at www.caweek.org call 08080 006 006, or text ‘GIVE’ to 70040 to give £5.